In their exhaustive research, the editors of William Blake’s Designs for Edward Young’s Night Thoughts (1980)1↤ 1 William Blake’s Designs for Edward Young’s “Night Thoughts,” edited with commentary by John E. Grant, Edward J. Rose, Michael J. Tolley, co-ordinating editor David V. Erdman (Oxford Univ. Press, 1980). were able to add four “new” copies to the two earlier censuses of colored copies of the engraved work,2↤ 2 W. E. Moss, “The Coloured Copies of Blake’s Night Thoughts,” Blake Newsletter, 2 (1968), 19-23; G. E. Bentley, Jr., “A Census of Coloured Copies of Young’s Night Thoughts (1797),” Blake Newsletter, 2 (1968), 41-45. and they state, “At present twenty-three coloured copies are believed to exist, all but one of which have recently been studied by one or more of the editors of the present edition.” Somewhat later in their commentary they continue, “Still untraced is the well-attested Gaisford-Macgeorge copy, called G in the Bentley census and last located in 1926.” The editors obscure this “well-attested” copy, since they choose to omit all mention of it from their census of colored copies. The only physical description appears in footnote 81, some forty pages after the census. While engaged in research quite unrelated to Blake for the Lutheran Church in America, I discovered this untraced colored copy of Night Thoughts in a disused closet, among the books bequeathed to the Church by Mrs. William T. Tonner in 1971. Upon her death, a portion of Mrs. Tonner’s distinguished Blake collection passed to the Lutheran Church, including one of the two recorded impressions of the color-print “Newton” (Butlin 307), an early state of the copper engraving, “The Canterbury Pilgrims,” and a drawing, “Moses striking the rock” (Butlin 445). The remainder of the Tonner Blake collection was given to the Philadelphia Museum of Art, and was described by Martin Butlin in the Museum’s Bulletin.3↤ 3 “The Blake Collection of Mrs. William F. Tonner,” Philadelphia Museum of Art Bulletin, 67 (July-September 1972), 5-31. Hereafter I will refer to the Gaisford-Macgeorge copy as the Tonner-Lutheran Church copy. I-12A (Moss-Bentley G). White Death. Bound in three-quarter red-brown morocco over greenish-blue marbled paper by Riviere, marbled end-papers. The spine is tooled in the style of Roger Payne. Top edge gilt, others uncut. Lacks the Explanation of the Engravings, which is, however, supplied in 19th century type-facsimile. Watermarks on twelve leaves. 16-¾ × 12-¾ inches. (42.5 × 32.8 cm.). Grotesque color on p. 10 (6E), p. 31 (18E), p. 35 (20E). No JC monogram. Engraved title-page to the second Night. Courtesy of the Lutheran Church in America. 6) The Lutheran Church in America.4↤ 4 I am grateful to Mr. Donald Trued, Lutheran Church in America (New York), for permission to publish this note. Inquiries concerning this volume should be addressed to him at 231 Madison Avenue, New York, NY 10016. Certain details of the provenance and physical description do not exactly correspond to those published by Bentley and Moss, neither of whom ever examined the actual volume. The most obvious of these differences is the absence of the Explanation leaf. As late as the Bishop sale, and when the volume was sold by Sessler to Mrs. Tonner, the accompanying bibliographical descriptions noted, “Laid in at the end is the scarce leaf of ‘Explanation of the Engravings,’” and pencilled in an unidentified hand on the front binder’s blank is the statement, “At the end is Blake’s explanation of the Engravings, often wanting.” The leaf included in the Tonner-Lutheran Church copy is, however, a curious and apparently unrecorded facsimile printed from type and loosely inserted in the volume, the source of which has not been traced.3↤ 5 It is possible that this leaf was printed to complete this copy of the book, and that it is not therefore otherwise recorded. The text of this leaf is a column-for-column and page-for-page reprint of the original, is printed on both sides of the sheet (as the original), but is in a much-reduced format: 11-1/4 × 8-5/8 inches. There are no stubs in the volume (other than modern binder’s stubs) to suggest that the original leaf of Explanation was ever present. Nor are there marks at any point to indicate where the facsimile leaf was “laid in at the end,” but modern stains from pressure-sensitive tape show that the leaf was crudely stuck facing the titlepage some time after the Bishop sale, since the catalogue entry for that sale was taped below the facsimile, and has left identical stains. Three further bits of penciled notes have not yet been identified; they may belong to the above-mentioned owners, or may indicate still further owners. On the verso of the front free endpaper is the notation “Cat/3759”; on the front binder’s blank is the price code “puuacy” and beneath that can be seen the erased price “1200.00”; and on the final free endpaper is written “c9901.” None of these notations is in Quaritch’s form; the volume also lacks that firm’s usual collation note. Sessler’s cost code, written by Mabel Zahn but now erased, can also be clearly read. This newly-located copy of Night Thoughts is textually complete with all engravings colored and printed in their correct locations. Neither “JC” monograms nor any other notes appear on the plates. The coloring of this copy of Night Thoughts has been compared with that of copy I-13 (New York Public Library, Print Room of the Art, Prints, and Photographs Division), and has been found to be reasonably consistent. 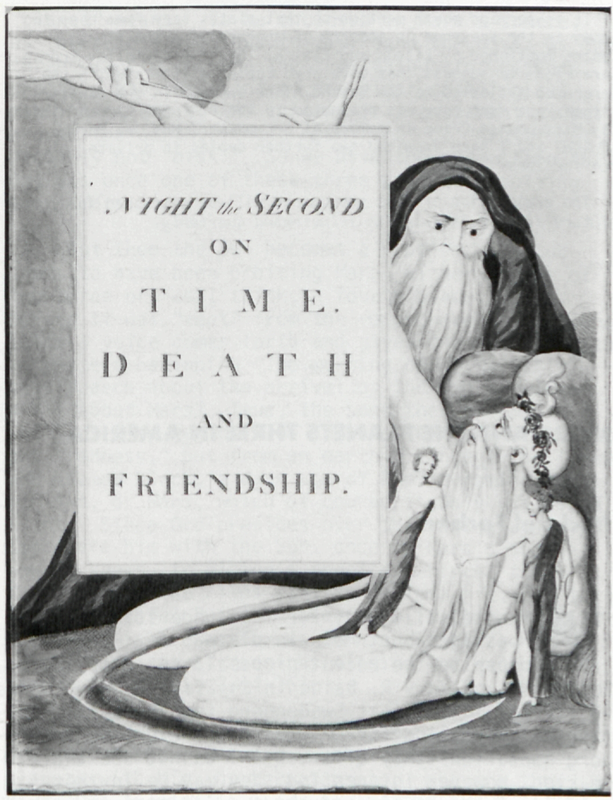 The only notable difference (other than predictable variations in intensity) is found on the figure of Death on the titlepage to the Second Night. In the NYPL and in other copies, the long flowing beard and shoulder are clearly visible; in this newly discovered copy that figure has been overpainted with a black hood and cloak, obscuring both hair and shoulder. Copies I-8 and I-11 seem to have this same feature. The engraving of this plate is, as usual, in the later state with added work.6↤ 6 It is perhaps worth mentioning that plates very from copy to copy in the presence or absence of engraved imprint lines, a point mentioned by Easson and Essick. Grant-Rose-Tolley-Erdman are right to suggest that uncolored copies exist in which the engraved titlepage to the Second Night appears in the earlier state; one such copy was presented to The Pierpont Morgan Library by Miss Louise Crane in memory of her mother, Mrs. W. Murray Crane, and I have examined two further copies in private collections. The question of placing the Tonner-Lutheran Church copy of Night Thoughts correctly in the census prepared by Grant, Rose, Tolley, and Erdman, is somewhat problematical since those editors are themselves inconsistent and somewhat arbitrary in their arrangement. They note, “There is no indication as to whether [this newly-discovered copy] is a White or Green Death copy. If it is of the former type and should prove not to have been tinted by Blake, it will fit well enough as copy I-16, yet begin page 136 | ↑ back to top stand somewhat apart since it uniquely contains the ‘Explanations’ sheet unbound, whereas all other coloured copies that include this sheet have it bound in one of three positions.” Now that it is recognized that this copy does not contain the Explanation leaf, it cannot be located as copy I-16. Even if it did contain this leaf it would not, according to the editorial criteria presented on pp. 60-62, be appropriately placed as copy I-16 since the surrounding copies, I-13 through I-15, are all seriously imperfect in one regard or another. Copies I-2 through I-14 have been arranged together by Grant-Rose-Tolley-Erdman, since all those copies contain what the editors have optimistically labeled “grotesque colouring” or “grotesque painting”7↤ 7 The explanation of this phenomenon will be discussed in a future article in Blake/An Illustrated Quarterly. ; within this group copies I-2 through I-7 are arranged together since they contain the leaf of Explanation bound after p. 95. These copies are further arranged “according to the earliness of provenance that can be established with some certainty.” Copies I-8 to I-10 have the Explanation leaf bound after the Advertisement, and copies I-11 and I-12 lack the Explanation leaf entirely. Copies I-13 through I-15 also lack that leaf, and are further deficient in lacking either text or colored engravings. The newly-discovered copy of Night Thoughts cannot be placed as copy I-16 since that would put it in the midst of seriously defective copies. Since it contains “grotesque colouring,” lacks the Explanation leaf, and has demonstrable provenance closest to copy I-12, this new copy can best be located as copy I-12A. It must be pointed out that the editors of Night Thoughts are inconsistent in the arrangement by earliness of provenance, and one might at the same time question the wisdom of organizing a census in part on such slight grounds as the binder’s location of the Explanation leaf. It may well be that this colored copy of Night Thoughts has escaped the notice of Blake bibliographers since it appeared in the Bishop sale under Young’s name at the very end of the last catalogue volume, and was not mentioned under the general Blake heading. When one considers the prices fetched by other Blake works at that sale, it seems that this copy of Night Thoughts might well have brought more if catalogued with the other Blakeana earlier in the sale.